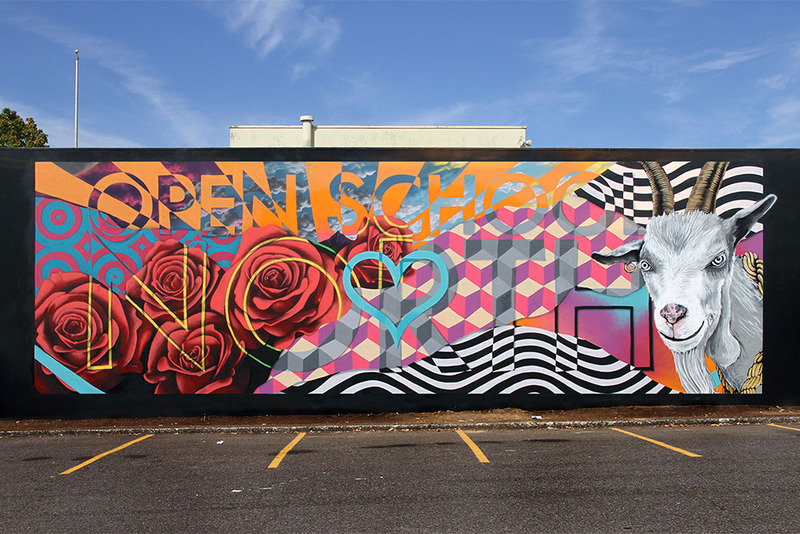 Inspired by his five-week residency in Portland with the Hollywood Theatre Education Program, care of Open School North, INSA, the acclaimed animated mural artist, has now made his proud and illustrious digital debut! 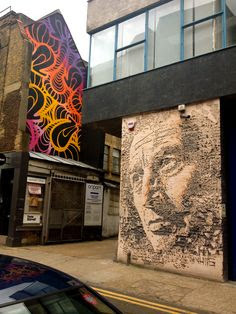 GIF-ITI, the term and process invented by INSA himself, involves photographing individual layers of a multi-stage, hand-painted mural, which are then combined into a looping digital image (or GIF). INSA has been commissioned to paint GIF-ITI all over the world, from Denmark to England to China to Taiwan. 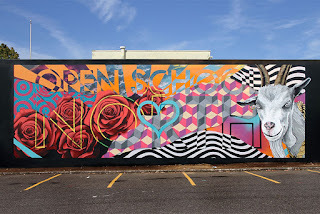 His latest work in Portland was painted on an exterior wall of Open School North (OSN) as part of an artist residency facilitated by the Hollywood Theatre Education Programs. INSA's Portland GIF-ITI design, conceptualized collaboratively with OSN students and staff, includes blooming roses, paying tribute to Portland as the City of Roses; a goat with swirling eyes, representing OSN's goat mascot; and the school's name with an inset growing heart. OSN students, ages 11 to 14, were involved in the project every step of the way, undertaking 80% of the painting. On Friday, October 9th, declared “Portland GIF-ITI Day” by Portland Mayor, Charlie Hales, OSN students and families, alongside school supporters and North Portland community members, saw the GIF-ITI mural come to life before their eyes in a special unveiling ceremony that included an acoustic set by indie band, Portugal. 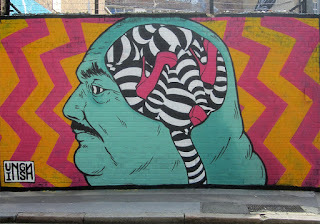 The final layer of INSA's GIF-ITI mural will remain on the Open School North building as public art. Visitors to the site can download INSA's free GIF-ITI Viewer app (available in the Apple and Android stores) on their smartphones, hold up their phones to the mural, and see it come to life as an animated GIF. INSA's artist residency with Open School North and Hollywood Theatre Education Programs was made possible through generous funding from the Regional Arts and Culture Council, Oregon Community Foundation, Oregon Arts Commission, Mt. Hood Cable Regulatory Commission, Juan Young Trust, and Comcast. 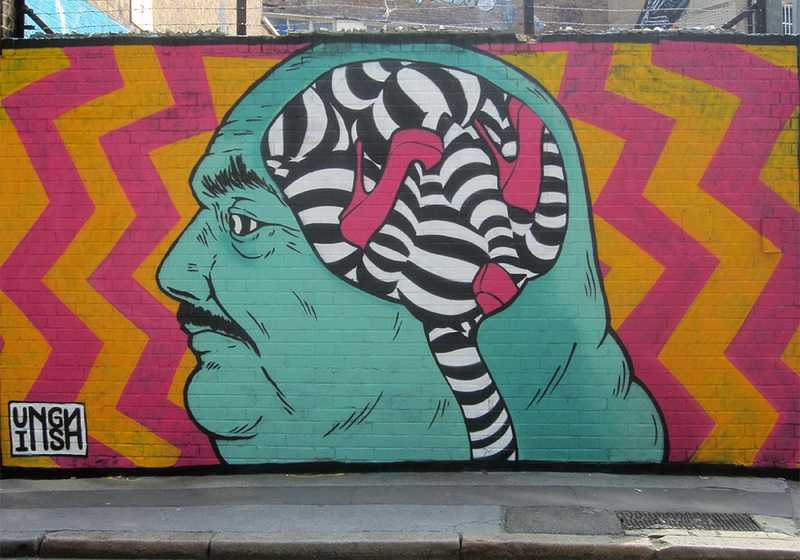 For more information about INSA's artist residency, view his Portland GIF-ITI mural via his GIF-ITI portfolio. Hollywood Theatre Artist in Residence INSA from Hollywood Theatre on Vimeo. Open School North is an equity-driven alternative school that serves 60 students in sixth through eighth grade, providing academic and social support to help students catch up to their peers and transition to high school. Many Open School students come from disadvantaged backgrounds, where they face homelessness, poverty, racial / ethnic discrimination, family drug and alcohol abuse, and more. At Open School, teachers work with students to develop positive self-concepts, respectful relationships with others, accountability and decision-making skills, and a sense of purpose and connection to the community.